I mean I need a cookie, like, right now. I’m not going to bother you on why all the over-dramatic-ness… The point is, we’ve all been there. Whatever reason it may be or ever is, there are times we all just desperately need a warm just-out-the-oven cookie, kind of immediately. You know by now I'm not reaching for the packet ones, because that negates the whole warm-just-out-of-the-oven gloriousness, but also, no. In a bid to be the very epitome of food DIY, it's time to make our own cookies, be brazen and firm and sure-footed in our cookie desires and just make them unapologetically. That doesn't mean I'm prepared to throw the waistline to the wind, end up curled up under the sofa wired and more stressed than I was before. I want the cookie without the regret. 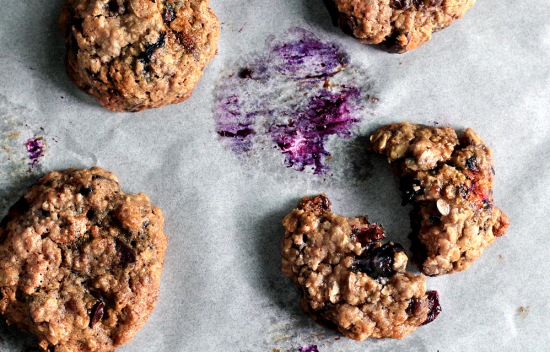 Here are the five healthy cookie recipes you need for those cookie-right-now moments. For the sake of us all, point me in the direction of your healthy cookie won't you? This is what happens when you get an incredible healthy blogger teaming up with a massive brand and inspiration around sugar-free living, these strawberry and caramel-centered chocolate cookies that are SUGAR FREE. Huh. Just chewy and pretty and basically heaven. Here's the recipe on I Quit Sugar. These rustic looking numbers are surprisingly healthy, a good option for packed lunches and work snacks. They’re packed with almonds and spice, and apart from the jam you plop in the thumb imprint on top, they’re not too sweet at all. But also, they're just so sweeeeet. One recipe, right here. So good that you don't need to justify it to your companions that it's low sugar, these oatmeal raisin cookies are sweet with pops of raisins. They have texture, crumble, chewiness, and need we mention they're low in sugar? When they taste so good, people will eat them anyway. Recipe here. 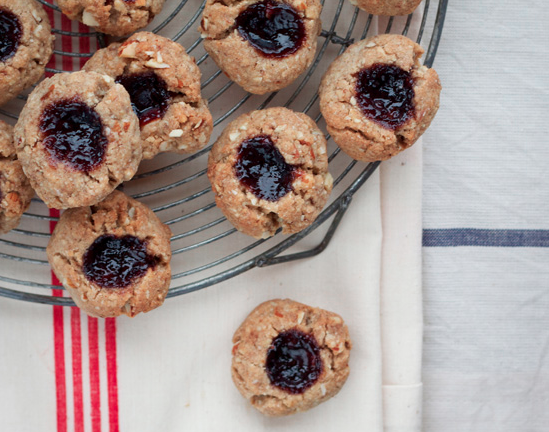 Not just another oatmeal cookie recipe, this number from the hilariously angry Lady and Pups doesn't involve chilling because you use frozen blueberries which harden the mixture. Genius. I want for go-to breakfast please. As she says: "A cup of hard-frozen blueberries that could be kept dormant and ready inside anybody’s freezer, will instantly hardens the cookie-dough upon impact. It’s so effective that it turns this browned butter (just because I had 5 min of sanity to spare), oatmeal and chocolate chips (as an insurance policy…) cookie-dough so firm and tight, that it almost gets a little difficult to fold. Instantly scoopable." These are healthy because of the blueberries, and because maybe Grandma was right, oatmeal for breakfast is a good idea. Yes please. Top image by Kate Gibbs.